After discovering Local Talk records back in 2011, the subsequent exclusive Groovement Soul interview and mix of forthcoming Local Talk releases by Mad Mats and Tooli told us what we already knew, they were gonna be a force to be reckoned with. The latest release on the juggernaut that is Local Talk is an early Christmas present for all the real house heads out there. To say this is a good record is the understatement of the year. On Local Talks 74th release its about time to get real…and we’re not only talking about the music! This is a heavy and political record that through music expresses the constant struggle for many African Americans living in the US today. Or like Jamie (3:26) said after he first heard Sameeds initial version – it instantly hit me with the raw pain and emotion or the lyrics. There is so much struggle in the world today, many black men and women are in emotional, mental and spiritual battles. 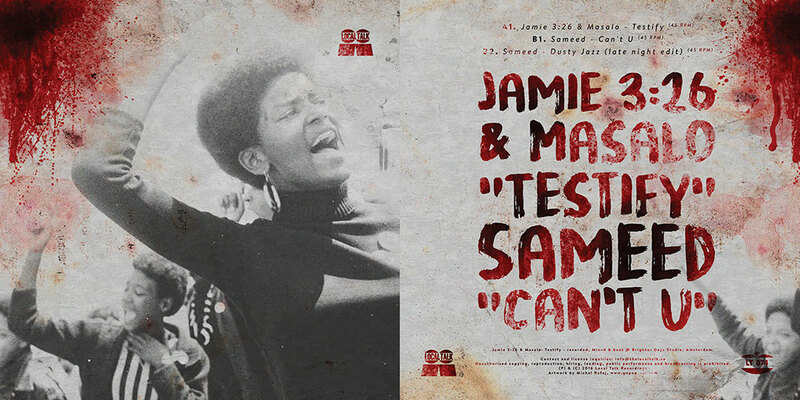 The message is delivered over two tracks, ”Testify” and ”Can’t U”. Both tracks are using the same themes and samples but with a distinct difference on the end result. Last track on the EP comes back to Sameed with another one of his signature laid back jazz tinged House outings. This man has a real handle on how to deliver a chunk on house heaven.